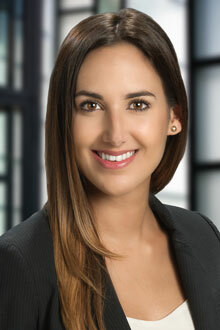 Nina Schmidt is an associate in the Fort Lauderdale office of Lewis Brisbois and is a member of the Complex Business & Commercial Litigation Practice. Ms. Schmidt handles various matters, including contract disputes, claims of fraud, breach of fiduciary duty, business torts, shareholder disputes, professional malpractice and intellectual property litigation. Ms. Schmidt also handles claims under the Telephone Consumer Protection Act (“TCPA”) and the Americans with Disabilities Act ("ADA"). She has extensive litigation experience, including jury trial experience. Ms. Schmidt has achieved favorable results for clients in both federal and state venues. Ms. Schmidt is an active member of the Palm Beach County Bar Association, where she serves as a Chair on the Circuit Civil Practice Committee and a member of the Business Litigation CLE Committee. Ms. Schmidt also serves on the Florida State University College of Law Alumni Association Board of Directors. During law school, Ms. Schmidt served as a member of The Law Review and the Business Review. She also earned Book Awards in Secured Transactions, Legal Writing and Research and Florida Civil Practice.